IT’S a comfortable two-and-a-half hour flight to Nassau, the capital of Bahamas. 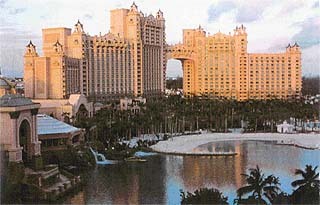 We’re booked at the Atlantis Hotel on the Paradise Island. That sounds exotic. When the Swedish industrialist Axel Wenner-Gren docked his yacht in Nassau harbour in 1939, he had already travelled 70,000 miles and he hadn’t yet found his paradise. Gazing on long lying Hog Island, then called, he must have heard a whisper of paradise from the cooling breeze which continuously drifts across the island. Straightway, he bought an estate there, dredged a pond and named it Paradise Lake. In time, the island came to be called Paradise Island. 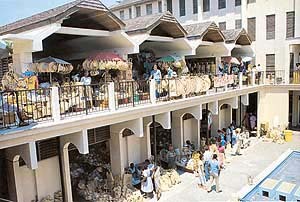 It has developed into a modern resort with hotels, water sports, beaches, golf courses. Then comes Sol Krazner, the American billionaire, imbued with an intense mission to give shape to the mythical Atlantis. Plato had painted a vivid picture of the fabled city and civilisation, and how Atlantis sank into the ocean and vanished, a consequence of devastating global changes. Despite a whole lot of expeditions, nothing tangible about such a submerged civilisation has come to light. Divers searching in the shallows of the Bahamian shelf reported finding isolated stone blocks of non-indigenous materials and what appear like columns. To Krezner the most likely site of the vanished Atlantis — an extension of the Mexican civilisation — should be in the Bahamas. And so his monumental effort at its recreation in the shape of Atlantis complex at the Paradise Island. The resort cost $ 800 million and was completed in December, 1998. International experts, artists, and engineers were employed for research and forming weathered-looking rocks out of special cement. The Atlantis resort offers more than 2,400 luxurious rooms, an impressive casino, 38 restaurants, bars and lounges, nightclubs, a theatre, a library, and every kind of water activity. Water attractions include lazy river ride, lagoon pool, paradise lagoon (snorkelling), royal baths pool, Mayan temple water slides and three extensive beaches. It’s water everywhere. The main attraction of Atlantis is the largest marine habitat in the world. Over 50,000 sea animals representing 200 species live in exhibit lagoons and displays. The Atlantis waterscape holds 11 million gallons of fresh water and salt water in 11 exhibit lagoons. Guests can get up close and personal with sharks, rays, spiny lobster, jellyfish, turtles, piranha, and many other fascinating sea creatures. They can take a walk through the 100-ft clear acrylic tunnel in the Predator Lagoon, or stroll to the cave outside the Beach Tower and view the fascinating sea animals through the panoramic windows into the Seagrapes lagoon. One must explore the Dig, a captivating interpretation of how life may have been in the legendary Atlantis. Discover an elaborate maze of rooms and corridors that take you back 11,000 years to the ancient city streets of Atlantis. The dig staff known as navigators are on hand to guide you through the labyrinths of wonders. The seakeepers staff feeds and takes expert care of all the extraordinary sea animals living in the Atlantis waterscape. Driven through the leafy, pleasant town of Nassau, we approach Paradise Island and cross the creek over a high modern bridge. Numerous luxury yachts lie moored at the Atlantis marina. Right in front, you see the marvellous twin towers as if rising out of water. The hotel lobby, the Great Hall of Waters, doesn’t fail to draw a gasp from a first-time visitor. Beautifully structured and ornate, it’s possibly the most arresting hotel lobby anywhere. One extensive side is nothing but a sheet of glass, holding back waters teeming with marine life. All around, guests are greeted by cascading waters as if to suggest that Atlantis has just risen from the deep. Our suite on the 12th floor of the Royal Towers is luxurious. A balcony with every room, commanding a panoramic view of the vast lagoon, various pools, and the ocean beyond. Our tour-package—airfares and six-day stay including full meals available at everyone of the restaurants for the five of us, costing as much as $ 7,000. We only pay for wine. And carry our own supply of single-malt Scotch for an evening drink before stirring out. The resort is so large and its facilities so varied, there’s hardly any occasion to move out. During our entire stay, we have gone out of the sprawling campus not more than twice. I combine the morning outing with a cup of tea at a hotel stall, followed by brisk walk on the beach, the cool breeze blowing in the face. We get together for a heavy breakfast by nine at the Marketplace, one of the venues offering breakfast. Cereals, waffles, pancakes, scones, muffins, all with maple syrup; sausages, ham, bacon, egg preparations made to order, prime cuts, kidneys, turbot; breads toasts; figs, stewed prunes, mashed potatoes, carrots, salads and various fresh fruits, rhubarb; milk, yogurt; jams, jellies, marmalade; and soft drinks of all sorts. Coffee, tea is served at the table. Everything that one can conceivably ask at breakfast is laid out there on long buffet tables in abundance. It is of excellent quality and inviting freshness. After such a breakfast, the only inclination is to loll in a reclining chair and read a book or newspaper, with a periodic dip in the pool. Or, lie at the beach, with an occasional wade into the sheltered, shallow waters. As pools go, the place boasts of an unmatched variety: zero-entry pools, kiddy pools, free-form and formal pools, and a 7-acre salt water snorkelling lagoon. Quite a few games and activities are arranged by the management for the amusement of those there, such as water golf and lessons in snorkelling. 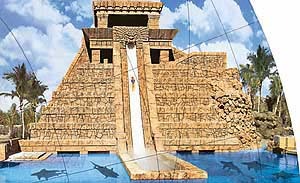 Thrill seekers go for the six-storey Mayan Temple and its Leap of Faith slide, propelling riders on a near-vertical plunge through an acrylic tunnel submerged in a shark-infested lagoon. The slide is an exciting experience. No wonder there’s always a queue for it. Braver souls can take a direct slide from the top on the other side to the pool below. Safety rules are posted at all pools, water slides, lagoons and beaches, with attendant lifeguards and they are enforced. As one moves into the glittering Casino (casual wear acceptable), brilliant glass sculptures by artist Dale Chihuly infuse the Casino with vibrant colour. The place is backed by the Dragons Nightclub and Joker’s Wild Comedy Club. Both of us like to try our luck at blackjack tables that allow minimum bets of $ 20. There were ups and downs but happily enough, we managed to come out even in five evenings of play. That meant a lot of free fun. One can hire a guide for bonefishing. The elusive bonefish (so named, for the huge numbers of bones in their bodies) and weighing around 3 to 7 kg, is rapidly becoming one of the most popular spotfish in the area. They live in deep water but come up onto the flats to feed, and that’s where you can catch them, often standing in knee-deep water. The guide and the angler work as a team; the former knowing the right spot according to the time of the day, the season and local conditions. By the end of a day-long session they did manage to haul a bonefish each. It’s an exciting game, they said, because on getting hooked, this fish explodes in a frenzy and runs away with the reel as much as 150 yards. And fights every inch of the way back as you frantically wind in. The Paradise Island golf club a, 18-hole course, is known for its rippling greens, while its 14th hole offers magnificent vistas of the Atlantic Ocean. Eighty sand traps and water hazards abound. We got the game at the appointed time and played at a fast clip; there wasn’t any hold up. One afternoon we took a round of the town. Had a glimpse of the Government House with the stately statue of Columbus in front. A look at the imposing ramparts of Fort Fincastle. One can climb a few of the 66 steps of the Queen’s Staircase, each step commemorating a year of her reign. It was a sight seeing tongas plying leisurely among cars on busy streets. Tourists coming down from cruise ships are known to take a tonga ride for novelty; not something unwelcome after being at sea. And we visited the popular Straw Market. Umpteen stalls tightly packed in sheds (reminded one of the INA shopping complex in Delhi, only cleaner and more orderly), each one overflowing with hand-made straw products: hats, purses, baskets, mats. Artisans weaving products right there. The profusion of shops selling jewellery, watches, perfumery. Almost every other shop on major streets selling these items. We were told, bulk of the buyers, mostly Americans, were passengers of cruise ships. They come down for a few hours when their ships dock. And the local trade claims that the prices offered in these duty-free shops are significantly lower than those obtained, say in New York.